The American Film Institute (AFI) has picked its top films of 2014 including coming-of-age tale Boyhood, Birdman and Angelina Jolie's Unbroken. Christopher Nolan's Interstellar, Foxcatcher, Jake Gyllenhaal thriller Nightcrawler and British code-breaking drama The Imitation Game also feature. For the first time the jury chose 11 films instead of 10, with many already gaining momentum this awards season. Whiplash, Into the Woods, Selma and American Sniper complete the list. The AFI selection comes ahead of the Screen Actors Guild and Golden Globe nominations later this week. All three tend to highlight which films will be the Oscar frontrunners when the nominations for the Academy Awards are announced on 15 January. 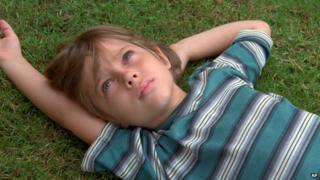 Richard Linklater's Boyhood - which stars Ethan Hawke and Patricia Arquette and was filmed over 12 years - has already gathered a head of steam, picking up several awards. In the past fortnight it has been named best picture by the Los Angeles Film Critics Association, the Boston Society of Film Critics and the New York Film Critics Circle. It also picked up best international independent film at the British Independent Film Awards. The AFI list is the first notable awards season mention for Unbroken, which is based on the life of Olympian Louis Zamperini, as well as forthcoming Disney musical Into the Woods and space fantasy Interstellar. Showbusiness satire Birdman also leads the nominations at this year's Spirit Awards and star Michael Keaton was named best actor by Boston's critics on Sunday. They AFI jury also selected its top television programmes of 2014, which includes Mad Men, Game of Thrones, The Americans and Orange is the New Black. Newcomers Fargo, Silicon Valley, How to Get Away with Murder, Jane the Virgin, The Knick and Transparent were the AFI's other top TV picks.